This is a common situation, and it's generally no problem. I'll use A for the country you're in, and B for the country you're going to, but all the "flows" described here work equally well if you want to use your B passport to go to a third country. At check-in, show your B passport. This way the airline knows you will be allowed to enter your destination. At the gate, show either passport, doesn't matter. On arrival immigration, show your B passport. At check-in, show your A passport. This way the airline knows you will be allowed to enter your destination. At exit immigration, show your B passport. On arrival immigration, show your A passport. Book your flight with the name on your A passport. At airline check-in, show your A passport that matches the name on your ticket, and your B passport, that proves you're allowed to enter. At exit immigration, show your A passport. At the gate, show your A passport, so that your name matches your ticket. On the way back, at check-in, show your A passport only. Things get harder if one or both your countries does not accept dual citizenship, especially if they care enough to look for visas or arrival stamps. The key thing to understand here is that the airline is not a part of immigration. They do not care if you have multiple passports and they are not going to tell immigration if you do, all they want to know if whether you will be allowed in at your destination. On check-in, show your A passport. Connect to your flight to B. At arrival immigration, show your B passport. At check in, show your B passport. If you need to check-in again, show your A passport. At C's exit immigration, show your A passport again and get it stamped again. At arrival immigration, show your A passport. This will have a departure stamp from C, neatly hiding that you were actually in B.
Beware that this is not totally foolproof, as a very careful inspection of your stamps will reveal that you were not in C for the whole time, but unless you're North Korean, it's unlikely you will be subjected to this level of scrutiny. Some people choose to go through immigration in C on the way out as well, so they get more decoy stamps. Doing that is necessary if you also want country B not to know that you've come from A (making the scenario symmetric). If you have different names and your countries don't like each other, you can still use the same method as above, but you'll likely need to book your A-C-A flight in your "A" name and your C-B-C flight in your "B" name. Exiting one country which I have a passport to and entering the other country to which I am a citizen (must use the right passport for each country). Going out of one country where I had a visa and into another where I didn't need a visa on my other passport. 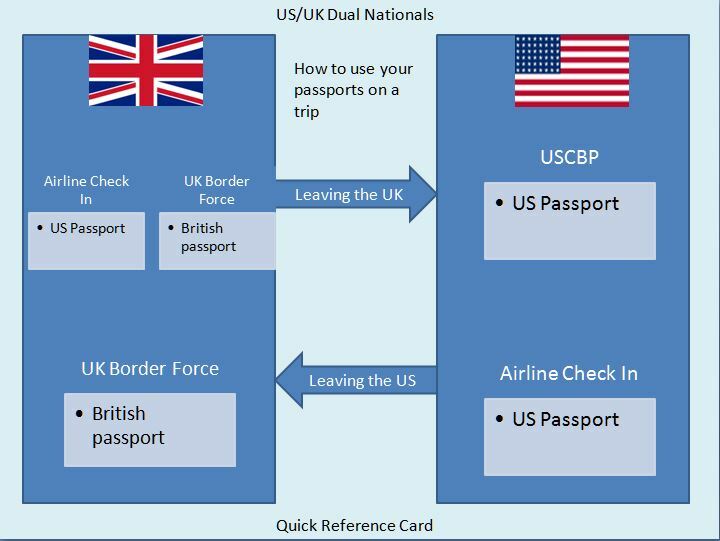 Usually I would try to use only one passport during a trip, if you must use two it's usually not a problem, you can just show both at check in (if needed) and at immigration (if asked). I was pulled aside one time in Hong Kong, mostly since my first name is spelled differently in both passports, after a short explanation I was sent on my way. It's only problematic if you hold a passport to a country that is refused entry (e.g. going to Malaysia with an Israeli passport) and try to enter with your other passport. I would highly advice against this. Most commonly this is an issue when travelling between the countries of your nationality, which has been well-answered by other people. Otherwise, it may be an issue if you have visa-free travel to a particular third country under one nationality and not the other - in which case, obviously, use the passport that you don't need a visa in. There is the case where you're travelling to a country that one of your nationalities doesn't get on with, in which case you can travel on your other passport. The obvious examples here are North Korea on a South Korean passport and parts of the Arab world on an Israeli passport. I would strongly suggest not using a second nationality in cases where you're facing that level of hostility; if you're exposed then you could be in real physical danger or danger of arrest. But there's another case where having multiple nationalities is useful. On most Western passports, you can travel to Israel; you can also travel to most of the Arab world. But if you try entering certain Arab countries with an Israeli stamp in your passport, then you'll be refused entry. If you have two passports, you can have stamps for Israel (and Jordan and Egypt if you enter across the land border from Israel) in one passport and those for the (rest of the) Arab world on the other. While some countries will issue you with two passports, it's a lot easier to keep them apart if you have two different nationalities (you're a lot less likely to pick up the wrong one by mistake). "Israeli citizens naturalized in the United States retain their Israeli citizenship, and children born in the United States to Israeli parents usually acquire both U.S. and Israeli nationality at birth. Israeli citizens, including dual nationals, must enter and depart Israel on their Israeli passports." A wrinkle I just encountered is that some electronic passport readers appear to be linked to departure records. I was travelling from New Zealand to the UK, and have ePassports for both (case 1 of the accepted answer). I showed my UK passport to the airline agent checking me in, and then attempted to use my NZ passport in the passport reader at the immigration control point. It did not work, and I had to use my UK passport instead. I am a citizen of three countries. I am going to travel to not two but all three countries. How do I book the tickets, on which passports? Traveling with two passports - which one to use? Do I need an ESTA for returning from a trip to the US, if I have US-Italy Dual Citizenship? Can I use both of my passports when I enter another country? How do I use my two passports when my surname is not the same in them?